Can you open wine with your shoe? Sometimes we find something so creative, so inspiring, so fresh, so ingenious, it makes us believe that anything is possible. Like this. Recession is here. Good-bye, Zima. Today MillerCoors announced it was ending production of the clear malt beverage Zima. We have no data to prove it but this seems one more sign of the economic sorting mechanism removing superfluous products during a recession. 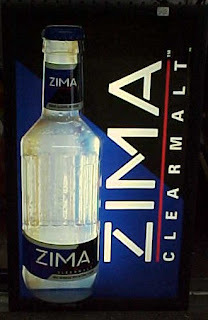 Zima launched in 1993 after test marketing in Nashville and two other cities, and sales peaked a year later with 1.2 million barrels sold. It broke ground as a unique malt beverage at a time when most wine coolers still contained wine (a footnote, wine coolers soon also switched to malt ingredients after an increase in U.S. excise tax on wine in the early 1990s squeezed margins) and fared better among women than men. Seems as times darken, U.S. consumers turn traditional in their drinking. In early 2007 U.S. wine sales were expected to top the world by 2010; Americans have slowed that growth a bit as they adjust to higher bottle prices resulting from the weak dollar, but U.S. winemakers say the overall growth trend continues. No more fancy clear bottles, please; just pour it like grandma did in the glass. Via Sara_MC.